I have been an insomniac most of my life. That is why I remember a certain event in Zurich so clearly. My trip had started January 12 in Glasgow. Many countries later, I realized I was running out of money, even with the low cost of staying in youth hostels and getting most places by hitchhiking. In Athens on April 9, I wired home to Mom and Dad to send cash. But it would take a while for the money to arrive, so I took a boat to Crete for a few days and enjoyed the sunshine. Got back to Athens around the 14th, got the money, bought myself an air ticket back home. It had to be Icelandic Airlines, and the closest point of departure was Luxemburg. Date of flight: April 21. Now I had to get moving. This was going to be very different from the meandering style of the past months. First leg of the trip was a boat to Brindisi. And then it was trains, one after another, all very slow, very crowded. One night was spent sitting on the floor in a corridor with people stepping over me. Another night was spent in the waiting room at the station in Milan. Somewhere along the way on those stuffy, swaying trains under bare yellow light bulbs, I met an American woman named Marian. She was impressively well-groomed, given the circumstances. Her hair was pulled back neatly into a bun that appeared to tighten the skin over her cheekbones. She was older than me, of course—everyone I met on my trip was older than me. She seemed possessed of great kindness and psychological insight—at least, she spoke of everything in psychological terms. She was going to Paris, but we both had to go through Zurich, and we spent the night on adjacent chairs in the Milan train station. We arrived midday at the Zurich station, that epicenter of punctuality. We decided to splurge on a hotel. We deserved it! At the booking desk in the station, we met another woman looking for a room. 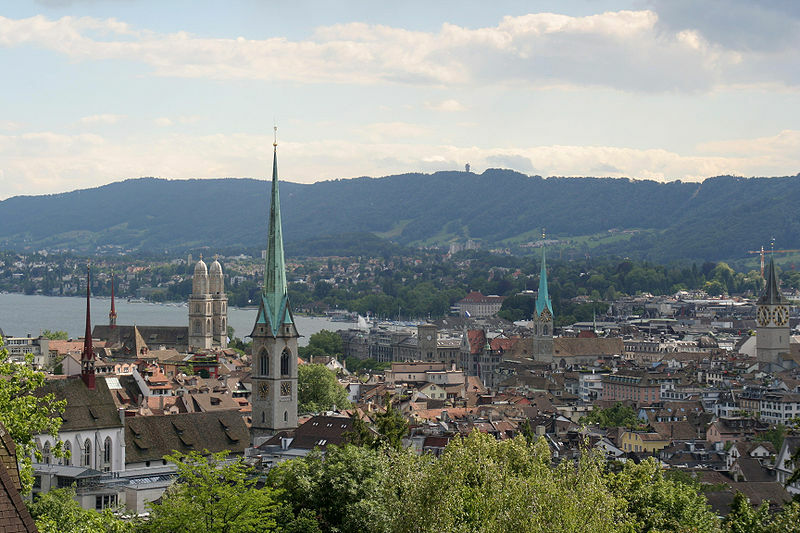 After seeing the price for a Zurich hotel, we decided to pool our resources and find accommodations for three. At least, that is what I think must have happened, but this might be a theory masquerading as a memory. All I remember for sure is that there were three of us in the room. Everything about Zurich seemed shiny and expensive. My best experiences had been at places more down at the heel, places like Cork in Ireland, where I ate bread, cheese, and ham at the youth hostel and was taken out for a pint at the pub. At any rate, after we parked our bags at the hotel, Marian and the other woman decided to go for a stroll, while I opted to take a book to read down by the lake. I was trying to bear firmly in mind that this was not only a city of bank accounts but the place where James Joyce had died. I sat beside the lake, which sparkled so brightly in the afternoon sun that I could hardly look at it. I felt so very tired. The book dropped out of my hand into the water and, since it was a cheap paperback—I believe it was “Flowers of Evil” by Baudelaire—it floated. I fished it out, but the pages stuck together. After a while I went back to the hotel. Marian and the other woman came in. They had met some friendly Swiss in a cafe and learned some local lore or picked up some local custom or other. That is the sort of thing that travellers are supposed to do, and I felt socially incompetent by comparison. We decided we would go out for dinner at seven. I lay back on the bed to get a moment of rest. When I woke up, it was the next morning. Marian and the other woman had decided not to disturb me. I had slept for about 15 hours, on my back, on top of the covers, with my shoes on. It had been a deep, black, restorative, time-stopping sleep, almost more like anaesthesia. I have always remembered that time when, for once, I was wrapped for long hours in the arms of Morpheus. It's the point in the back. You go up one of those shady draws. This is a fairly tough off-trail hike in the neighborhood of LeConte. 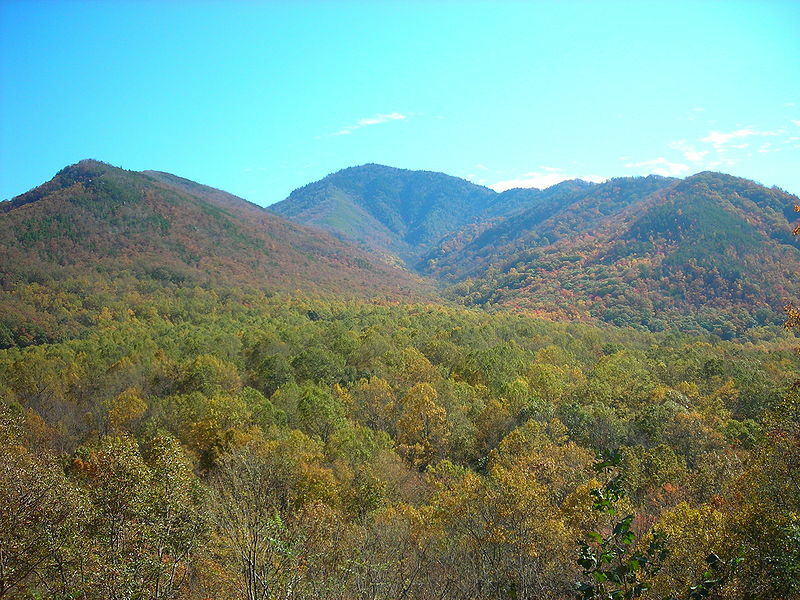 You start at what is now called the Carlos Campbell overlook on the Newfound Gap road, cross the West Prong, and follow Big Branch until you hit the Bullhead trail. If you study the photo above, you see that the valley of Big Branch climbs only moderately for quite a long way, and then it hits a wall. You climb the last 800 vertical feet to the trail in a quarter of a mile. Then you have the option of climbing another 1000 feet to the top of Balsam Point, which is a useless sort of blackberry-ridden place. I carried my map, compass, and altimeter, as usual, but this hike does not really pose a navigational challenge. It leans toward other sorts of challenge. It was not hard to follow the West Prong to the junction with Big Branch and turn up the branch and climb past the foundation of an old stone house. The trick was to find the best route to take along the stream, for the water was far too high to rockhop it. Since the stone house stood on the right bank, I continued climbing for a while on that side. But I found that the small ridge I was walking on rose higher and higher above the stream. When I checked my map, I saw that the other side was going to stay flatter along the branch, so I decided to switch sides. I meant to angle gradually back to the water to preserve my elevation, but some bluffs forced me straight down a muddy chute into an indescribably awkward place where I was trapped between slimy logs and the edge of the creek. I found myself teetering on unstable stones, pushing brush out of my eyes, and trying to get my toe unjammed from between two logs. Finally I flailed my way onto a treetrunk and got over to the other bank. The fast stream roared beside me as I climbed in the sunshine. It sang with the voices of all of the tricklings of water that ran into it as it tumbled down the mountainside. I worked my way along, either close to the water or only within hearing distance of it, depending on the terrain. I would ride up on the back of the ridge until the brush beat me back to the boulders and the singing water. Eventually the stream got small enough that I could stay in it. When it began to get really steep I stopped beside a waterfall for a snack before the last big push. The sunlight that day shone pure and brilliant. The light turned the fringes of spruce and balsam into glowing lace. I sat in a little pocket of shadow and gazed up at the light flooding the treetops. The waterfall poured faithfully down into a dark green basin lined with moss. It was time to move on again, and I had to scramble over the heaped-up boulders to get around the waterfall. It was more or less the same ingredients the rest of the way up. The water had gouged much of the soil away, so that I was scrambling up layers of bedrock over which the stream dropped in shining strands of cascades. It was like a staircase in which each step stood two or three feet high and the treads were only a hand’s width deep. Brush growing here and there made for some good handholds. But my toes were slipping on the slimy rock, and the damp moss was drenching me, so once more I moved away from the creek. For no reason that I can explain, I enjoyed the steepest part. It was vertical enough to use all fours to get up, it was brushy, and it was crisscrossed by little bluffs that had to be worked around methodically. I was working hard but barely noticing the effort. If your legs are strong, you have the satisfaction of applying good tools to the task at hand, like using sharp scissors to cut through thick paper. I picked my way through the brush, squirmed under blowdowns, and circumvented a boulder as big as a house. A pleasing little chute led up a bluff. One by one I took on the obstacles, kept moving, sweating, climbing. Ahead stood another bluff. It stood as high as I am tall, and it was quite vertical, but there was no stopping me now. I grasped a projecting stone and began to pull myself up, noticing out of the corner of my eye a rusting iron stake jammed between two rocks. How did that get there? Grabbing onto a small tree and heaving myself over the top, I suddenly realized that I had just climbed up a retaining wall and now stood on the Bullhead trail at 4800 feet. Return was via the ridge that leads toward Ramp Creek. I later co-led this hike for the Smoky Mountains Hiking Club. I can’t remember exactly why it was that I was doing this scouting by myself.